When Cubby and Tinkerbell came to stay with us in January, we had end tables in our livingroom that were sort of tall and narrow. They had nice varnished tops that didn’t need coasters. They weren’t very safe, though, with an almost two-year-old who climbs everything, and sometimes you just have to pick your battles. Soooo … we replaced those end tables with a couple of vintage, thrifted tables that are wider and lower and sturdy enough to be used as climbers. They’re beautiful tables that have stood the test of time, but a cold, sweaty water glass could doom their finish quite quickly. 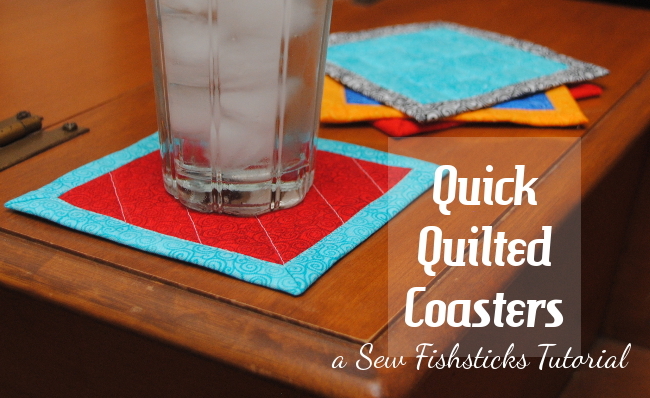 In the beginning, we threw washcloths and dish towels on the tables … until I couldn’t stand it any longer and found time to sew up a stack of coasters! 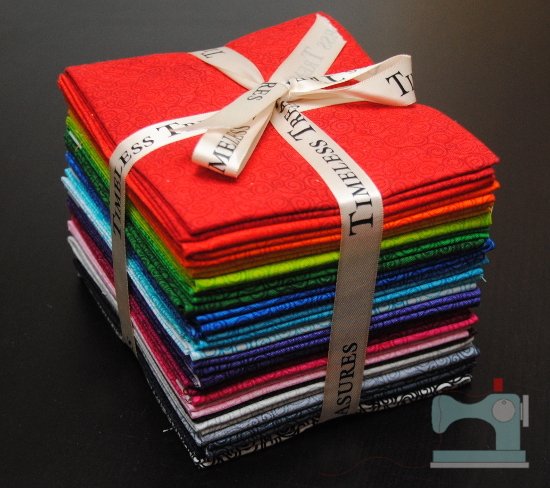 Thankfully, I happened to have this beautiful rainbow-colored stack of fat quarters from Timeless Treasures ready and waiting. (Do you ever want to just leave these ribbon-tied stacks sitting on your shelf because they’re just so pretty? Don’t do that! Sew something!) You don’t really need a whole stack of fat quarters for this project, though. 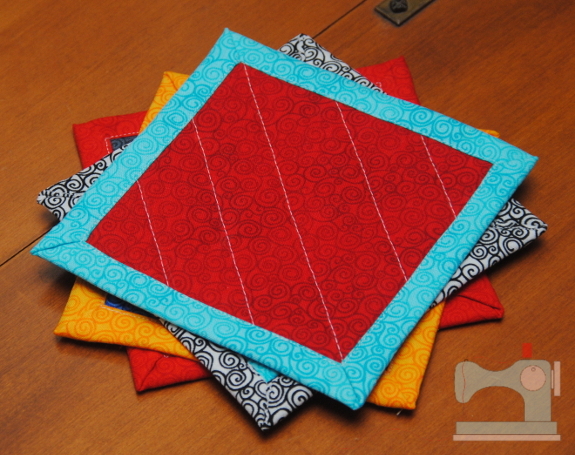 These coasters use a 5″ charm-size square for the top, and a slightly larger 8″ square for the bottom. 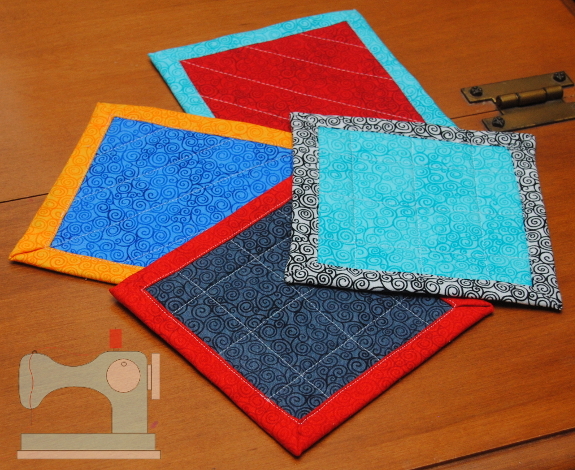 They are incredibly fast to make, and they’re a great way to practice and improve your quilting skills on a small scale. I put together a tutorial so that you can make up a stack of your own, too. They’re a practical way to use up your fabric and batting scraps. (You’ll want to use cotton or cotton-rich batting for its absorbency.) You could choose a favorite fabric line to feature in your home, or rather than just using two fabrics, you could piece a small quilt block for the top. These would make a great housewarming gift, too! 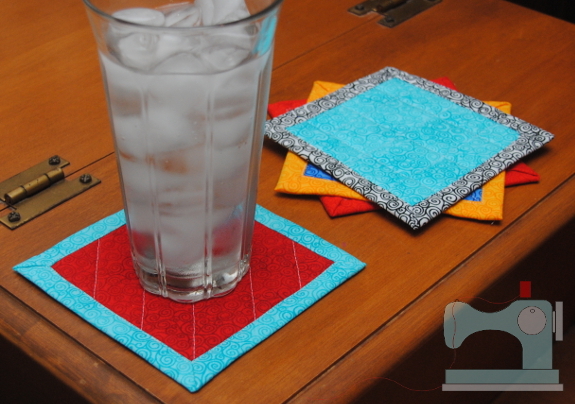 To download the tutorial, just go here: The Quick Quilted Coaster Tutorial. I’ve got half a dozen more cut out and ready to sew! Oh! That’s a great idea! I love practical gifts! I so appreciate small projects, too, Lynn! I enjoy the feeling of accomplishment from getting something done quickly, and using up those scraps is always a good thing.